Grass cutting. To many a lawnmower would spring to mind, if you're lucky enough to have a lawn. 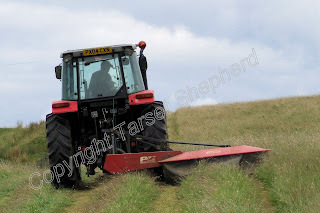 Here in Tarset it is the tractor and mower, time is marching on and those that have not as yet managed to gather their winter fodder are getting a start. The weather has been poor, to say the least, over the past few weeks and farmers have been hoping a better week might be coming as they don't want their valuable winter fodder ruined by rain. However, there comes a time when you just have to bite the bullet. Fields are being dropped in bits. Dyke (wall) backs cut first as they take the most drying and also if the rain comes hopefully the cleared ground might dry enough not to cut up as the machinery runs over it when the middle of the fields are done. Silage is planned at the moment, it can be gathered as a greener crop and so take less hurt from the rain, should the weather improve no doubt there will be an attempt to make hay. The grass needs to be dried out to make hay, dry sunny days would be appreciated. We'll wait and see. Falstone Show - what a day! Grass comes free, or does it?